‘Bide My Time Until I Die' features the Toronto duo slammin’ out 10 new bangers that capture both the simplicity, and the energy of their live shows. 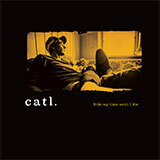 Recorded over 3 different sessions, one in Memphis and two in Toronto, CATL. wanted to make a record that allowed each engineer to interpret the songs in their own way. Adam Hill at Sam Phillips Studio, Jeff McMurrich at Sonology, and Walter Sobczak at Revolution Recording had no idea what the other engineer was up to and were left alone to do their thing. Garage Rock legend Jim Diamond (of the now defunct Ghetto Recorders studio in Detroit) brought it all together in the mastering process, somewhere in France.